My favorite holiday decoration is a hand-carved wooden Christmas pyramid, a gift from my father bought during his trip to Germany. It is such a neat little piece, bought shortly before he died…a wonderful reminder of him around the holidays. It has a sweet little nativity scene at the bottom, angels armed with their trumpets looking out from on high, and then the shepherds and wise men rotate around JC and the fam when the heat from the candles hit the top propellers just right. We love watching it go around and around, it’s a magical little toy. Whimsical, really. The poor king who had to lug the hot pot of delicious soup to Bethlehem. So, in honor of my Dad, and the historical license that is afforded with such things, the gifts of the Magi (in my home) are now, and forever will be: gold, frankincense, and soup. I like to think it was a nice lentil, or perhaps a corn chowder. Thanks again, Dad. 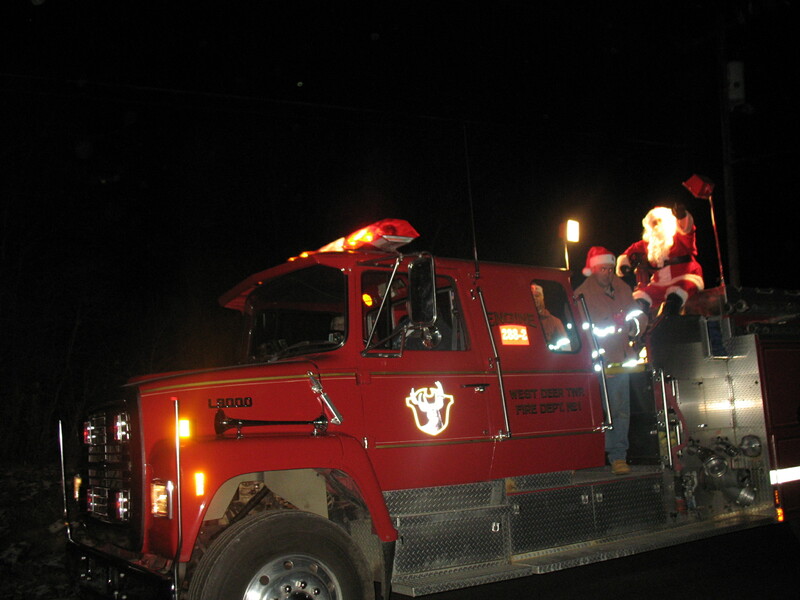 Every year around this time, our local fire department (one of three in the township) drives a big fire truck around the streets; sirens blaring, lights flashing, and Christmas music playing. That would probably be cool enough for my kids, but, there’s something even more awesome to this scenario, something even better: Santa is standing up on that fire truck! Waving! Ho Ho Ho-ing! Big spotlight on him! BIG! When we hear the sirens within about a 3 mile radius we are like Navajo Wind Talkers trying to figure out how close or far off the engine is. When he (HE) finally arrives, the kids excitedly run up to the road, talk to Santa for a minute or two, and get a few candy canes. My husband and I usually duke the firemen a little to cover gas, or beers for later. Whatever, we don’t care. It’s awesome. The only problem with this event, is that this fire department doesn’t come past our house with Santa on an engine every year. Our township is huge, and in many parts pretty sparsely populated. I understand it’s probably tough to get to every street every year, I understand. The worst thing, though, the absolute WORST, are the years when the bedazzled engine crosses over our road at the corner and just keeps going. They don’t turn on our street, nary a stop at the stop sign. The crossroads is about 200 yards away…so the kids could run for it, but they’re usually just too busy freaking out that the engine isn’t turning. For as fun as this happening is some years, other years it is just torturous. 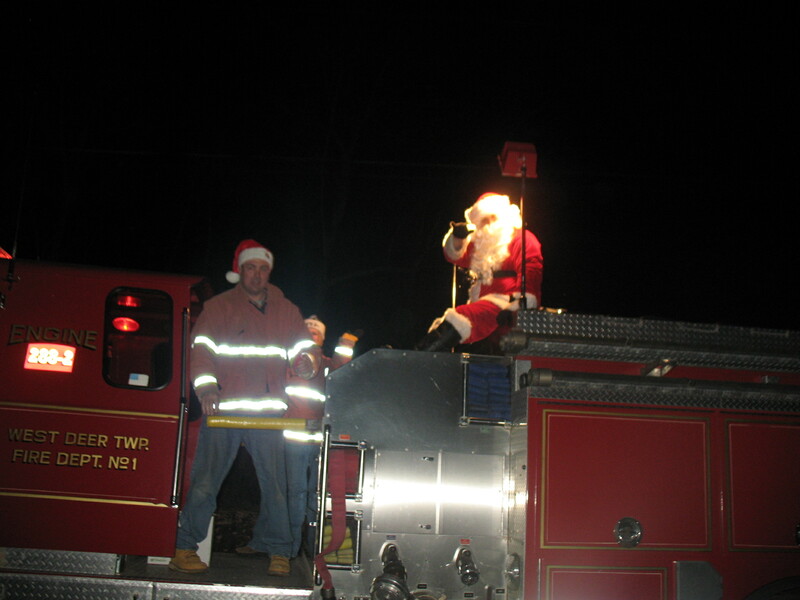 Santa in front of our house, 2008. So last night on our way to Cub Scouts, there, at the end of our street we saw *gasp* a fire truck with lights a blazing! This was it! The big guy was. On. Our. Street! So, being mother of the year, I roll down EVERYONE’S windows. We’re gonna see him. We’re gonna talk to him. He’s *our* road’s Santa tonight! Now, as we approach the engine, the boys are really having at it. Screaming: “SANTA!! IT’S SANTA!!!!! HE’S HEEEERREEEE! WHHHHHHHHHHHOOOOOOOOOOOOOOO! !” Loud. I mean, Santa’s not gonna miss us this time. Then, as we get a little closer, I notice that the truck isn’t moving. 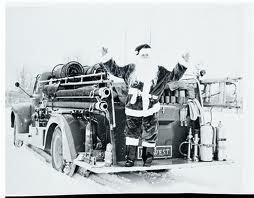 Hmm, I figure Santa’s just inside the engine, doing some last minute primping. Getting candy canes in order. Texting the missus. Brushing his beard. You know, Santa stuff. But those lights are still going. He has to be in there! Finally, we’re right in front of the engine, and–boy this is weird–it’s in MY lane? Facing me. Parked. Now, the kids are still screaming. And they’re still loud. They’re not letting Santa pass them by this year. I will also add that they are now unbuckled and halfway out of their respective windows. Whooooo! Throw caution to the wind, this is Santa! At this point of the story, I would like to take this opportunity to extend my sincerest apologies to the family at the end of our street who may (or may not) have been dealing with a very serious emergency last night when *that* fire engine was parked right outside of their house. With the engine’s emergency lights on. Red and white lights spinning. When we were screaming with joy out of the Blazer’s windows, we really, I mean really, didn’t know that someone inside might have, oh, say, just had a heart attack, or that maybe your basement was on fire. I swear. And I really hope everything’s OK today. I sincerely do. And please, I don’t want you to think that we were celebrating your hardship, and subsequently booing for any reason other than our disappointment that Santa was not on that engine. I’m sure you understand, right? When I drove past you and your family members (slow motion movie scene style) and you were all glaring at us from your front porch, I could see a glimmer of understanding. I sincerely hope to see you again in 2011, big guy. Growing up, we didn’t celebrate Saint Nicholas Day. I remember certain kids coming into school talking about this cool and mysterious holiday. 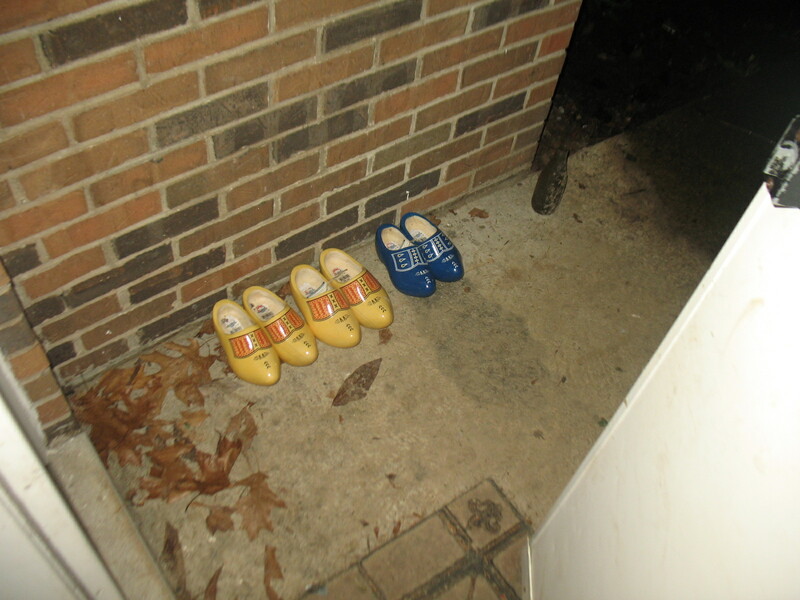 All I could gather was that they put their shoes out one night and got little gifts in them the next…and I did not. I’m not (that) bitter, but that’s about all I remember about the holiday. Recently, my mother and sister took a trip to Holland for my beautiful cousin’s wedding. 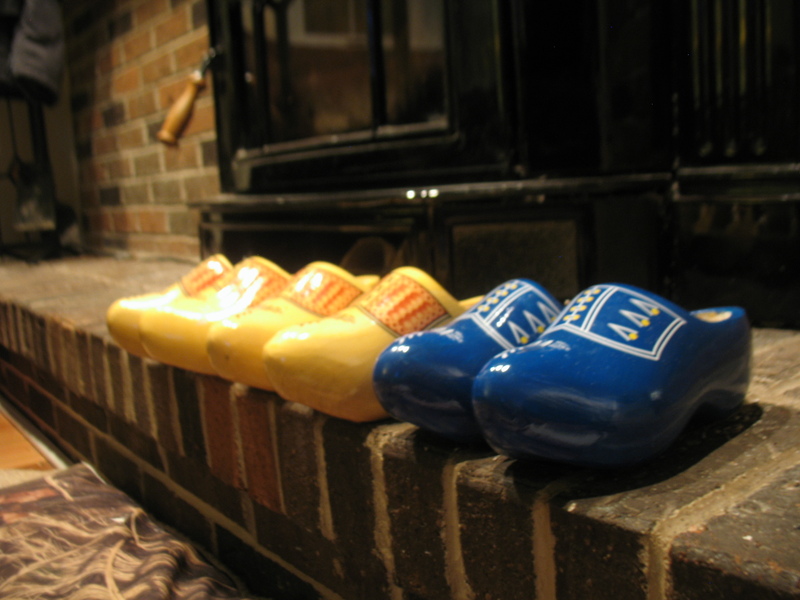 They brought us back these awesome wooden shoes. 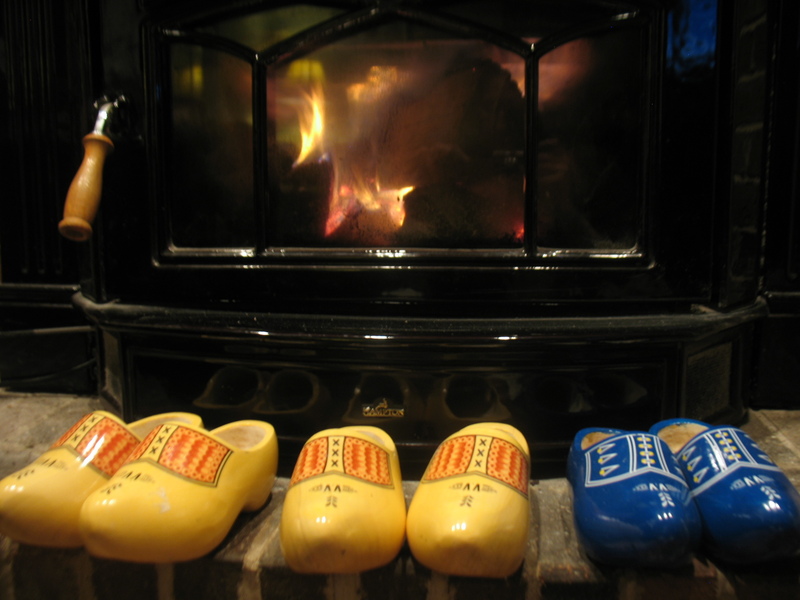 Now, I guess we found out the rule for fitting wooden shoes a little too late: take what your shoe “looks” like and then buy a pair of wooden shoes TWICE that size. 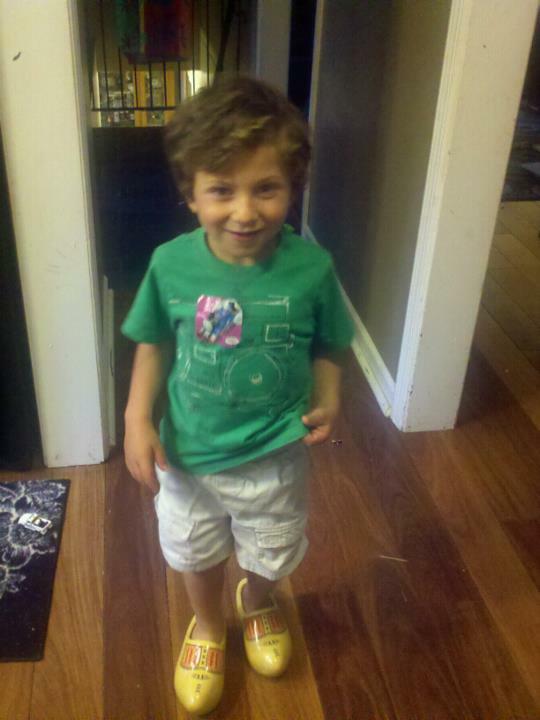 The older boys (kind of THANK GOD) couldn’t wear theirs, but the youngest took full advantage of clogging around in a pair. Since the shoes were just so beautiful (and let’s be honest: super annoying), we decided that the best use of these art pieces would be to set them out for Saint Nicholas Day. So, the kid is slightly appeased. But, let’s break this down: I basically just told him the ghost of HIS DEAD GRANDFATHER was coming into the house to deliver his goodies. I mean if GERMANS freak him out, what is the thought of a ghost in the house going to do? I really did have good intentions, but fast forward about five minutes. He comes out crying. He doesn’t want a German OR a ghost bringing absolutely anything into the house. We talk. We compromise. We decide that the shoes can go outside. He was pleased with this idea, and he was asleep almost as soon as his head hit the pillow. One more punch in my kid’s future therapy card.